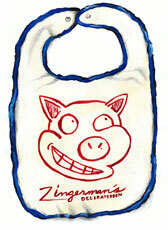 Zingerman's Baby Bib for sale. Buy online at Zingerman's Mail Order. Gourmet Gifts. Food Gifts. Our oversized, washable soft cotton toddler's bib sports a happy pig illustration that shows the world just what kind of eater they're dealing with. Perfect for budding gourmands, especially those that like to play with their food.